Windows 10 operating systemWindows 10 brings back the Start Menu from Windows 7 and introduces new features, like the Edge Web browser that lets you markup Web pages on your screen. 15.6" touch screenTypical 1366 x 768 HD resolution. Natural finger-touch navigation makes the most of Windows 10. Energy-efficient WLED backlight. 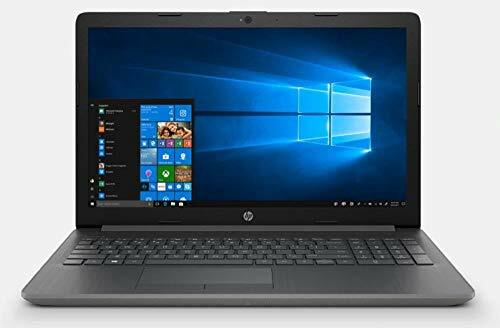 8th Gen Intel® Core™ i3-8130U mobile processorSmart dual-core, four-way processing performance for HD-quality computing. 8GB system memory for advanced multitaskingSubstantial high-bandwidth RAM to smoothly run your games and photo- and video-editing applications, as well as multiple programs and browser tabs all at once. 1TB hard drive for ample file storage spaceHolds a sizeable collection of digital photos, music, HD videos and DVD-quality movies. 5400 rpm spindle speed for standard read/write times. Cloud support lets you access your files anywhere Intel® UHD Graphics 620 Weighs 4.52 lbs. and measures 0.9" thinBalances portability and screen size, so you get a respectable amount of viewing space without the laptop being too cumbersome for practical portability. 3-cell lithium-ion battery. HDMI output expands your viewing optionsConnect to an HDTV or high-def monitor to set up two screens side by side or just see more of the big picture. Built-in media reader for simple photo transferSupports SD memory card formats. Wireless and wired network connectivityBuilt-in high-speed wireless LAN connects to your network or hotspots on the most common Wi-Fi standards. The Gigabit Ethernet LAN port also plugs into wired networks. Additional portHeadphone/microphone combo jack. Windows 10 home 64 bit, 3-Cell Lithium-Ion Battery (31 Wh), 15.12 x 10.0 x 0.95, 4.60 lbs, Black.